The one-hour premiere, "The Siege Part III", aired on July 15, 2005. The theme song for the series received an Emmy nomination in the category "Outstanding Music Composition for a Series (Original Dramatic Score)". The series was developed by Brad Wright and Robert C. Cooper, who also served as executive producers. Season two regular cast members include Joe Flanigan, Torri Higginson, Rainbow Sun Francks, Rachel Luttrell, Jason Momoa and David Hewlett. The timely arrival of the Daedalus, led by Col. Steven Caldwell, saves Maj. Sheppard's life from a suicide bombing run. Atlantis wins the first round against the Wraith and therefore think they are safe for the moment, but then discover that many more hive ships are on their way to Atlantis. Thankfully, with the new ZPM, McKay might pull off another miracle. Strange malfunctions begin to occur when newly promoted Lt. Col. Sheppard along with other members of the expedition return from a trip to Earth aboard the Daedalus. When things go too far, they discover that the ship has been infected by a Wraith virus, and now it has the instinct to stay alive, even if it has to kill in order to survive. Meanwhile, periodic flashbacks reveal the events of their visit to earth including a meeting with Ford's cousin. Following a lead on the whereabouts of Lt. Ford, Lt. Col. Sheppard and Teyla get captured on P3M-736 by Ronon Dex, a man who they find out is a runner, hunted by the Wraith. When they offer to help, the team must face off against their old ally, and in the process possibly gain a new one. On Planet Thenora after the team witnesses the aftermath of a culling, a Wraith Dart suddenly appears, beaming Dr. McKay and marine officer Laura Cadman aboard. After shooting the dart down to preserve Atlantis' secret, the team discovers that Cadman's consciousness is trapped inside McKay's body. Sheppard's team stumbles upon a technologically advanced society, the Olesians, who purposely leave their criminals in a penal colony near the Stargate, so that the Wraith may discover them first. But after the prisoners shoot the jumper down, the team discovers that this punishment is too effective and the crime rate drops, forcing the Olesians to start sentencing petty criminals and innocent people to the Wraith. After having found an experimental Ancient power generator, McKay becomes obsessed with triumphing where the Ancients failed, but the price may be too high. Elsewhere, Teyla and Ronon travel to the planet Belkan to trade, but discover that not all of Ronon's people died. While investigating a planet, the team comes across a Wraith girl who has been raised by her human "father", hiding from the people of the nearby village in fear of her life. But she doesn't consider the consequences when she takes an incomplete drug to turn herself human. After Sheppard is injected with the Wraith retro-virus, the Atlantis team races against time to find a way to reverse his transformation into an Iratus bug hybrid. But even though he might make it difficult for them, he could be the key to his own salvation. The team finds an Ancient warship still inhabited by Ancients in suspended animation. They are all connected together through a virtual environment, that Sheppard enters to communicate with them. The only problem being, the Ancients think that their virtual lives are reality and they have an unexpected enemy in their midst. Sheppard's team is kidnapped off-world, only to find that their captor is none other than Aiden Ford. He has recruited several men into taking the Wraith enzyme, and now they intend to use the team to destroy a Hive Ship to prove the "glorious" effects of the drug. After the attempt to destroy the Hive backfires, the team is captured by the Wraith and Sheppard finds himself up against the Wraith Queen who is demanding answers. Meanwhile, Dr. McKay takes a massive dose of the Wraith enzyme and escapes to Atlantis in a state of frenzy, but his choice could put him on the edge of death. Sheppard gets pulled into an Ancient device, separating him from the rest of his team and the outside world. While trying to get him out, the team discovers that time moves much more quickly where Sheppard is and he could die of old age before they release him. It is discovered that The Trust have infiltrated Atlantis and planted a bomb inside, set to go off the next time they dial Earth. To add to the tension, two Wraith cruisers are on the way, and Dr. Weir wants to figure out if there could be a Goa'uld spy in Atlantis' midst. During the test run of a recently repaired puddle jumper, Captain Hugh Griffin is getting under Dr. McKay's skin by espousing various ideas about science history, including the myth of the flat Earth during Columbus' time. But the jumper crashes into the ocean and sinks slowly to the bottom. Eventually the pressure is too great for the windows and Griffin sacrifices himself to seal McKay into the rear compartment. When he shows the first signs of losing hope, he must rely on a hallucination of Lt. Col. Samantha Carter for his survival. The team finds a world that possesses Ancient technology, but only the royal family may be allowed to operate it and lowly villagers are treated with little dignity. When he tries to set things right, Sheppard finds himself a pawn in the rivalry between the heirs to the throne. After recovering two alien stasis pods from space, the minds of the inhabitants are transferred into Dr. Weir and Sheppard. But when it's discovered that the two are in fact enemies hoping to settle an ancient score by killing each other once and for all, the entire population of Atlantis is put in danger. Ladon Radim comes to the expedition wanting to overthrow the Genii leader, Cowen. They are reluctant to help, but it seems he has discovered a ZPM that he could trade with the expedition. The Genii set a trap for the Atlantis team on a ruined planet, M6R-867, and Radim's true motives are revealed. An amnesiac young Lieutenant in Atlantis, Michael Kenmore, suffers poor treatment from the personnel and disturbing nightmares that he is a Wraith, yet things become worse when he accidentally stumbles upon a shocking discovery about himself... he is one. The team comes to aid a low-level technological civilization, the Taranians, taking refuge throughout an Ancient outpost. While trying to repair systems, McKay discovers a supervolcano below the outpost that will obliterate life on the entire planet of Taranis, suggesting evacuation to a new planet. Yet during the evacuation process, the Stargate is swallowed up by the supervolcano. A Wraith faction (including Michael) contacts Atlantis to seek help in destroying their common enemies, the Wraith. Because the Wraith are currently engaged in a destructive civil war, they suggest using Atlantis' retro-virus to turn their native foes into human prey. "Runner" is the last episode where Rainbow Sun Francks (portrayed Aiden Ford) is credited as a regular cast member. Jason Momoa joins the main cast in this episode. While rehearsing scenes for "Duet" where Cadman has control of McKay's body, Jamie Ray Newman would do a scene first, and then David Hewlett would try to mimic her movements, cadence, accent, etc. Alan C. Peterson, who played the Magistrate in "Condemned", previously played Canon in Stargate SG-1s Demons. The episode title of "Trinity" is a reference to the Trinity test. The outdoors parts of "Instinct" were filmed on location at Lynn Valley Canyon, North Vancouver. Jewel Staite, who played Kaylee Frye on the cult Sci-Fi show Firefly, is the second Firefly cast member to guest star on a Stargate series, the first being Adam Baldwin in Stargate SG-1 episode "Heroes". She would later go on to play Dr. Keller as a recurring guest star at the end of Season 3, continuing into Season 4 prior to becoming a series regular in season 5. "Conversion" was actress Rachel Luttrell's first on-screen kissing scene. Her parents were present for the kiss. Every scene in "Aurora" where Ronon appears in the environmental suit had to be played by a body double because Jason Momoa's head would not fit in the helmet. The title of "The Long Goodbye" is an homage to Raymond Chandler's 1954 novel The Long Goodbye. "Coup D'état" was supposed to feature the return of Acastus Kolya (last seen in "The Brotherhood"), but because of conflicts with Robert Davi's schedule it was rewritten to feature Kolya's second in command Ladon instead. For "Allies", Brent Stait took over the role of Michael throughout the episode. Conner provided the voice after the crew felt it 'needed' it. The strongest episodes on the Nielsen ratings were "The Siege" and "Instinct", "The Siege" was the only episode in the season that was able to get a syndication rating. The lowest rated episode in the season was "Michael". "The Hive" was nominated for a Gemini Award in the category "Best Sound in a Dramatic Series" in 2006. For "Grace Under Pressure", Joel Goldsmith was nominated for an Emmy in the category "Outstanding Music Composition for a Series (Original Dramatic Score)". Don Houston from DVD Talk said that the second season did "rise to the occasion" and surpassed its sister show Stargate SG-1. ComingSoon reviewer Scott Chitwood said that is "should satisfy" viewers, but commented that it didn't have the same quality as Battlestar Galactica and gave the series 6 out of 10 and the DVD package 8 out of 10. June L. from Monsters and Critics (M&C) gave the season 4 out of 5 and said that it was a "pleasure to watch the stories", compared to other new science fiction shows which depends on blood and violence. Dan Heaton from Digitally Obsessed said that the season suffered an "identity crisis," but was throughout good and entertaining because of the good acting among others. ^ Martin Gero (2005). "Stargate Atlantis: Season Two Preview". TV Zone Special #64. Visual Imagination. pp. 80–81. ^ Gosling, Sharon (July 2006). "Trinity". Stargate Atlantis: The Official Companion Season 2. London: Titan Books. p. 45. ISBN 1-84576-163-4. ^ Gosling, Sharon (July 2006). "Conversion". Stargate Atlantis: The Official Companion Season 2. London: Titan Books. p. 53. ISBN 1-84576-163-4. ^ DVD audio commentary for "Conversion"
^ Gosling, Sharon (July 2006). "The Long Goodbye". Stargate Atlantis: The Official Companion Season 2. London: Titan Books. p. 84. ISBN 1-84576-163-4. ^ "Season Two Ratings". GateWorld. Archived from the original on 2009-08-01. Retrieved 2009-05-20. ^ Sumner, Darren (July 6, 2006). "Stargate Atlantis receives Emmy nomination". GateWorld. Archived from the original on July 14, 2009. Retrieved 2009-05-10. ^ Don Houston (March 6, 2007). "Stargate Atlantis - The Complete Second Season". DVD Talk. Retrieved 2009-05-10. ^ Scott Chitwood. "Stargate Atlantis: The Complete Second Season". ComingSoon.net. Retrieved 2009-05-10. ^ June L. (March 7, 2007). 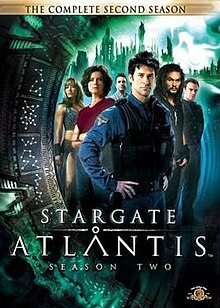 "DVD Review: Stargate Atlantis - The Complete Second Season". Monsters and Critics. Archived from the original on May 19, 2009. Retrieved 2009-05-10. ^ Dan Heaton (March 5, 2007). "Stargate Atlantis: The Complete Second Season". Digitally Obsessed. Retrieved 2009-05-10. This page was last edited on 22 December 2018, at 08:31 (UTC).